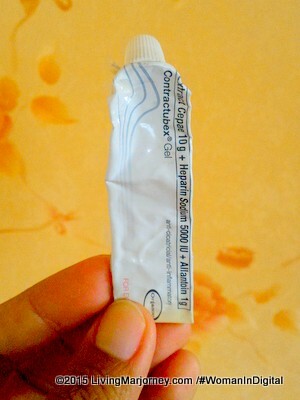 CONTRACTUBEX ointment has been part of my skin care regimen since April of last year. You have probably read on this blog what happened and why I had to undergo exploratory laparotomy sometime in April 2014. Aside from working on getting back to daily routines and gaining my strength, I also have to deal on the 3-4 inches scar below my navel. Every time I look at the scar, it reminds me of all the blessings I received. Imagine, my body started to get poisoned when the appendicitis ruptured. Because of that I got infection on large intestines and peritoneum. But as I said I was thankful for all the love, care and support from my family especially from my mom and husband. Last week, I met brave and inspiring people who shared their experiences dealing with life, difficulties and scar. Rubylyn Cua Rodel, burn survivor. Dwight Bayona, a karter who lost his right leg. Richard Tagapan, a PNP SAF officer who suffered right arm injury in line of duty. Immediately, I was advised to apply Contractubex. This ointment helped my skin in healing process and reduces scarring. What I noticed during several months of application is the decrease in itchiness and tension. I don't even use binder one month after surgery. Although I have to be honest that at first I doubt it because I'm prone to keloid and there's nothing I can do about it. But when my aunt who also undergo exlap showed me her flawless abdomen, it changed my mind. You can't even notice the scar. This Contractunex 10 grams gel lasted about 6 months with daily to every other day use. Just a small amount and gently massage on the wound, especially on the sides of the wound/scar as per doctor advised. I still have the scar, it's very obvious specially if wearing swimsuit but I'm not shy anymore. It's the scar that saved my life. A scar that will remind me that life is short. Do you have scars in your skin or soul? How do you manage? 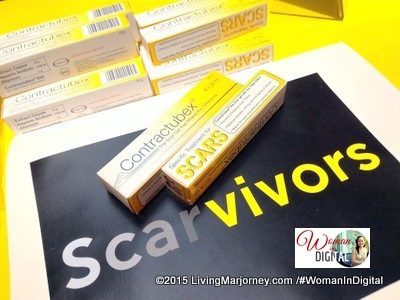 Let Contractubex heal our skin scars and the inspiring scarvivors help our soul scars. Have you ever tried Contractubex? 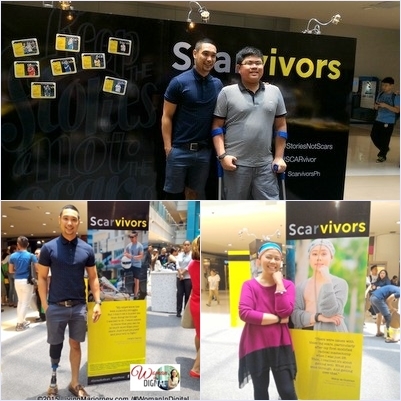 Let's support the Scarvivors, you may visit the gallery at the atrium of SM Megamall.